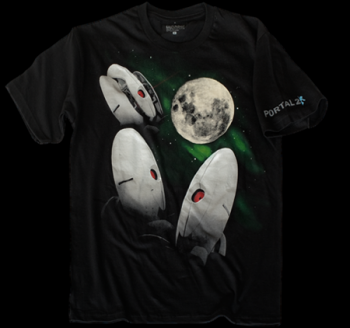 If you're not too busy playing Portal 2 today, why not buy the awesome "Three Turret Moon" T-Shirt? So I've been pretty much playing Portal 2 all day today. It's really awesome. I just got to the part where I had to spoiler the spoiler in order to spoiler spoiler and then spoiler did spoiler and I spoilered into the spoiler only to spoiler my spoiler with the Portal Gun. (Note: Not an actual spoiler). Most people will be interested in the Apparel section, with its collection of Portal 2 shirts and jackets. Personally, I'm in love with the "Three Turret Moon" shirt you see here to the right, but I'd also really like to get the Aperture track jacket, too. It's just so classy. For those with some empty wall space to fill, the Prints section has some rather nice artwork. There's some concept art there, and some posters that wouldn't be out of place in Aperture's offices. There's the arbitrary action shot of Portal 2 co-op stars ATLAS and P-Body, if you want robots hanging on your bedroom wall. There's only one item in the Accessories tab, however - a pint glass bearing Aperture's logo circa 1940. Hopefully it doesn't automatically lace your beer with asbestos or a deadly neurotoxin; that would be bad. Anyway, I've got my eye on that Three Turret Moon shirt, but right now I'm going to go back and play Portal 2. Can you really blame me?